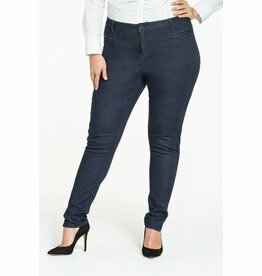 The Rebecca Trouser is a slim medium rise ponte trouser with a tapered leg. Faux leather adds subtle detail in tuxedo stripes and pocket trims. Angled front pockets. Extended tab with double hook and bar closure, zip fly. Tonal stitching, silver-tone hardware, quilted side panels.